After impressing a lot of critics with earlier releases of the Jumpman C-Series, the Jordan Brand is looking to make noise once again with the simplistic style and colourway that is set to come out this June. The Jumpman C-Series will be released in White/Metallic Silver-Varsity Red colourway, which obviously looks simple but very attractive and appealing. 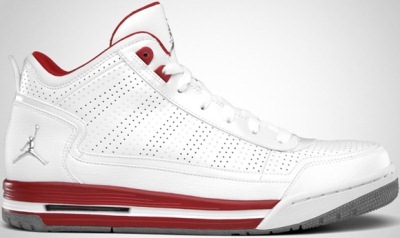 It is made up of a white upper part with varsity red accents on the midsole and cool grey outsoles. Like before, the Jumpman C-Series will come out at a very affordable and reasonable price so there not harm in trying to experience the glamour of this new release from JB this June 2011.